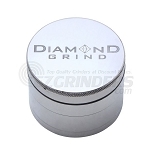 Diamond Grind premium brand grinders deliver on both durability and quality. The anodized aluminum design, an oxidation process that adds an extra protective layer, is vital to fighting wear and tear that you would experience with most other standard aluminum grinders. Each 4 piece grinder comes with a magnetically sealed top, stainless steel sifting screen, and bottom storage compartment. The extra large size is a massive 75mm (about 3 inches) giving you all the grinding room you could ask for.